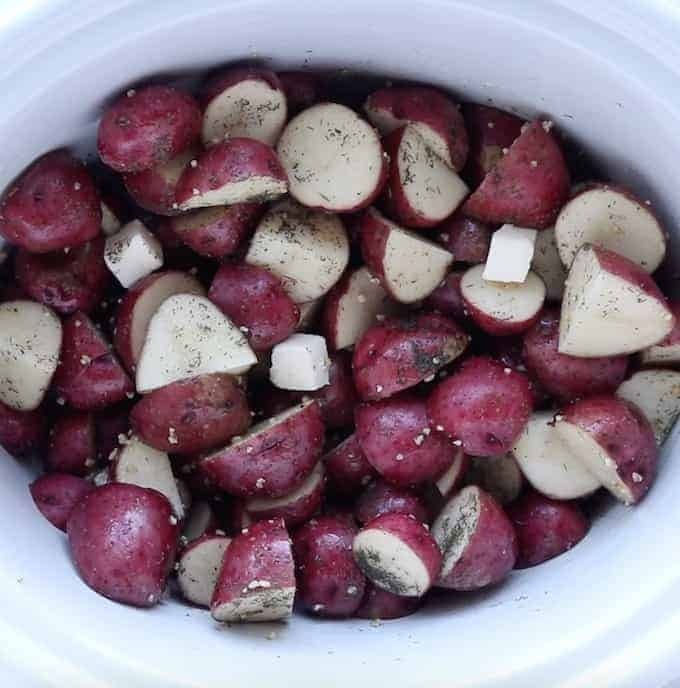 Crock Pot Potatoes – a delicious and easy slow cooker recipe to serve your family or a crowd! 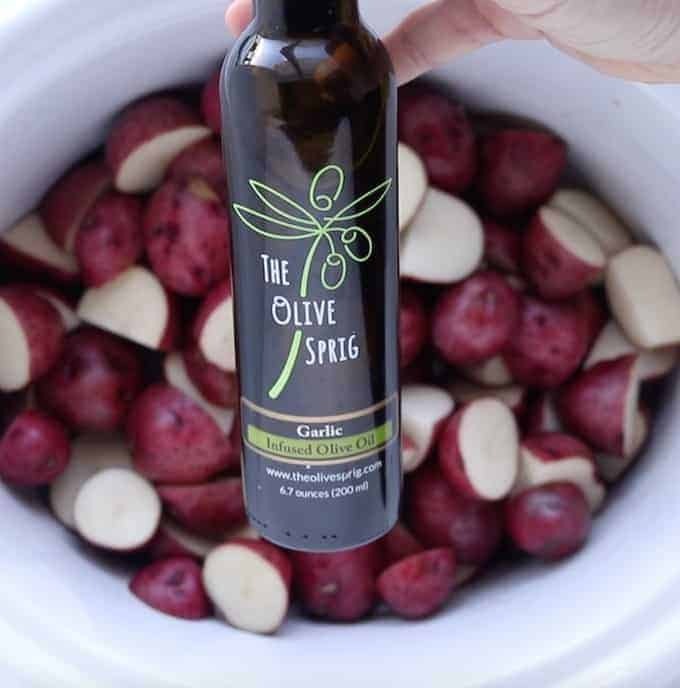 The hints of garlic with olive oil, butter & spices will make this recipe a family favorite! 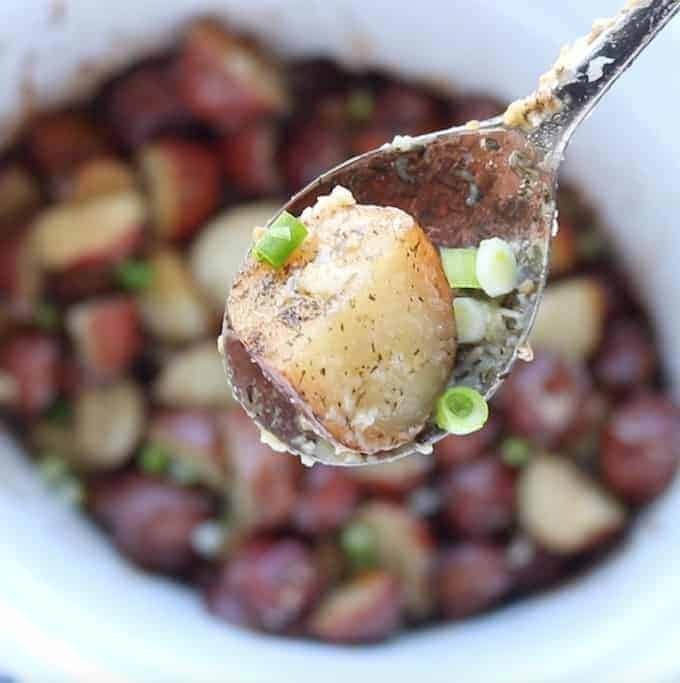 This crock pot potato recipe is a staple in my house because everyone is running in different directions. Between school, activities, and work, life can get a bit crazy! But, being able to make a recipe with under 10 ingredients has been a lifesaver. Keep reading for step by step instructions or watch the video now to see how simple this potato recipe is to make! Using an Instant Pot instead of a crockpot is another great option – especially if you want to turn this recipe into a quick baked potato soup! 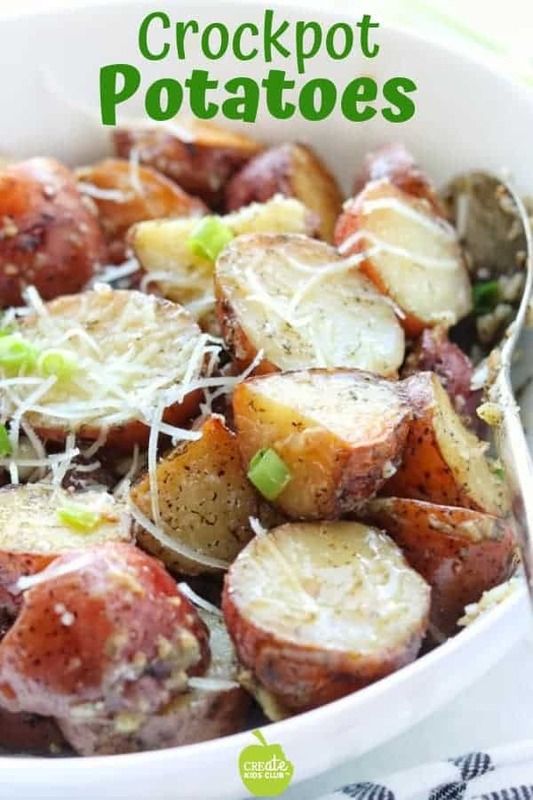 In the past, I have tried to toss whole red potatoes in my slow cooker for this recipe. However, believe me when I say that slicing each red potato is 100% worth it! 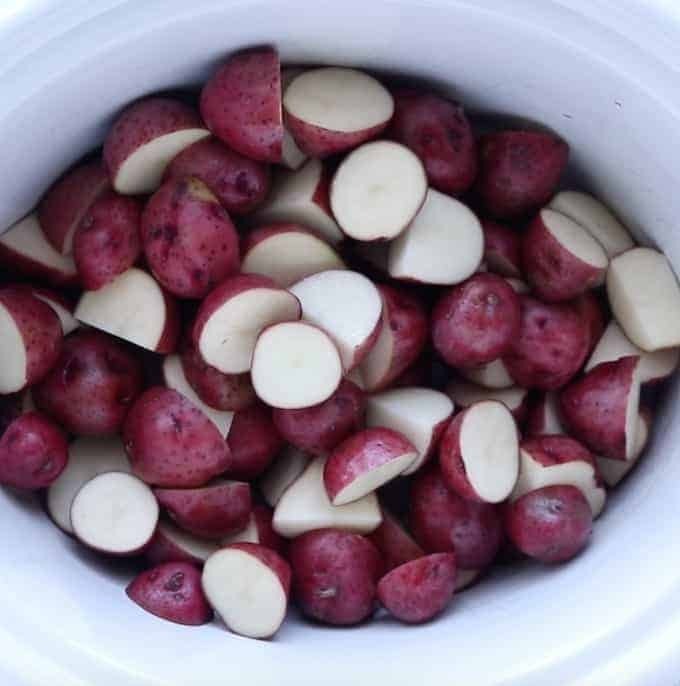 Using red potatoes for baking, roasting or in slow cooker recipes is my preference because these potatoes will hold their texture. For instance, the flesh of the potato will stay firm while cooking because of the waxy skin. WHAT BOTTLE OF OLIVE OIL DO I PICK? Do you ever stand in the cooking oil aisle at the grocery store and wonder which olive oil to buy?! There are SO many options these days and it can be overwhelming. I change the seasonings that are added to this recipe each time that I make it because I love to try different options. Overall, I recommend swapping, adding or eliminating spices from this recipe based on your flavor preferences and cabinet stock! 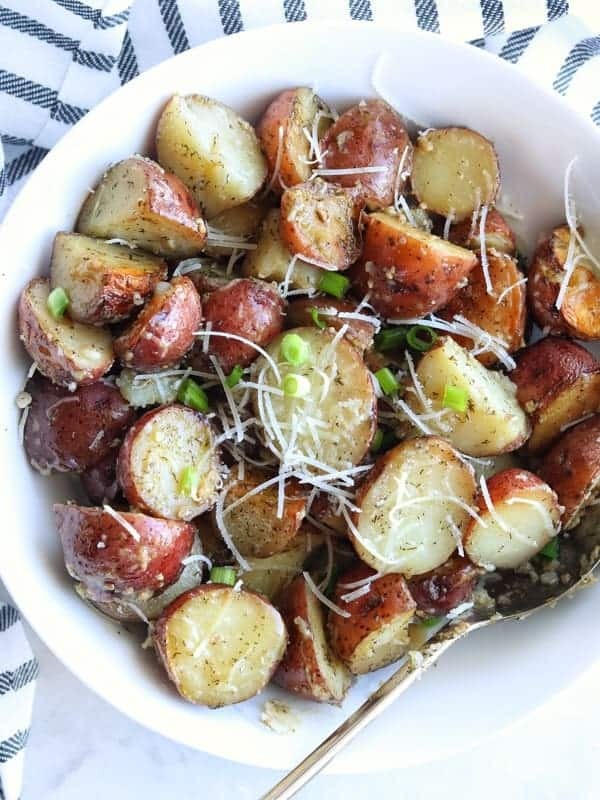 ARE THERE OTHER SPICES I CAN ADD TO CROCK POT POTATOES? 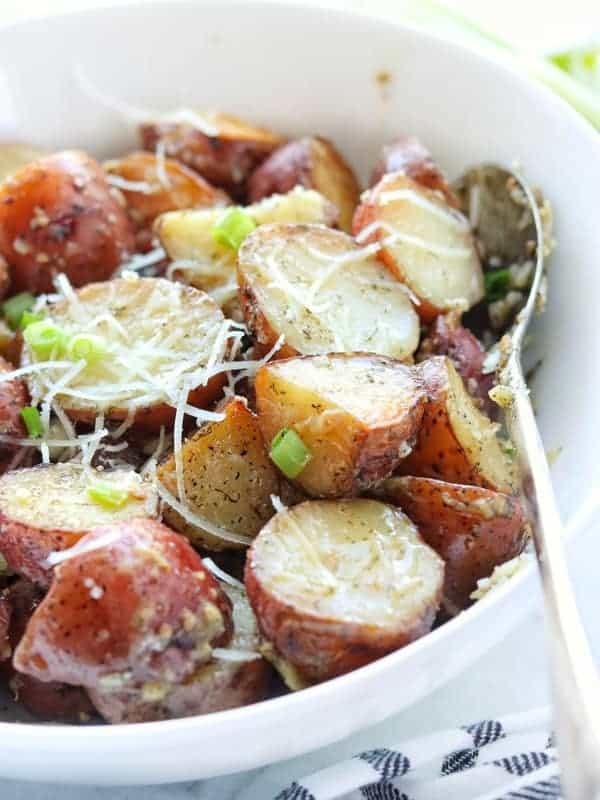 WHICH TOPPINGS CAN I ADD TO CROCKPOT POTATOES? Overall, the possibilities are endless! 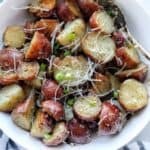 WHAT DO I SERVE WITH CROCK POT POTATOES? 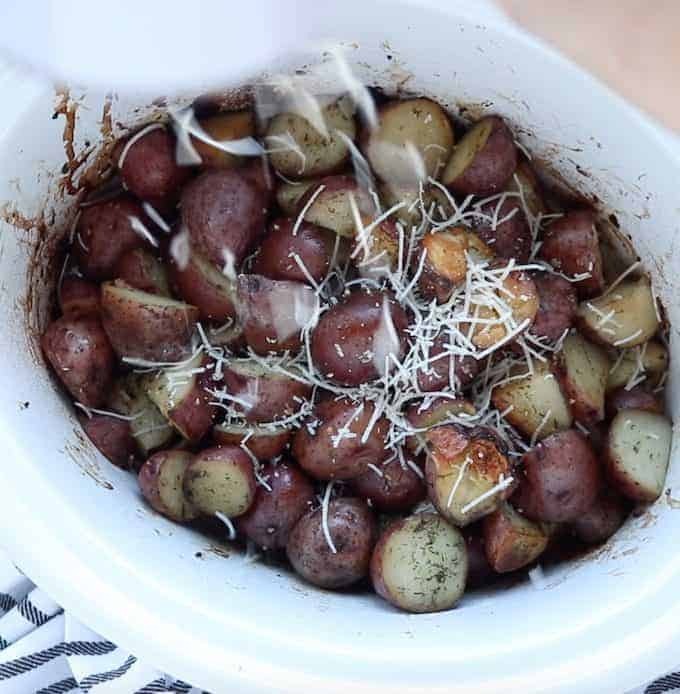 Remember that your family will love this recipe no matter what you serve with these Crockpot Potatoes so pick your favorite and enjoy! These were the easiest side dish I ever mde! Thank you for the simple recipe!